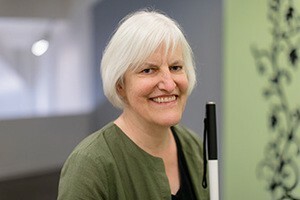 Photo of Georgina Kleege smiling wearing a green jacket and holding her cane. Recently we had the pleasure of meeting Georgina Kleege, a lecturer in the English Department at UC Berkeley. Georgina is an amazing woman who has written influential books such as Sight Unseen — a classic in the field of disability studies, Blind Rage: Letters to Helen Keller — a book that blurs the lines between fiction and non-fiction, and her most recent book, More Than Meets the Eye: What Blindness Brings to Art — an exploration of blindness and visual art. Georgina has been praised for her work and writing and has been recognized by awards such as the Distinguished Teaching Award from the Division of Arts and Humanities in 2013, and from the UC Berkeley campus as a whole in 2016. And Georgina also happens to be Blind herself. Georgina’s recent work with making visual art accessible for people who are Blind/Low Vision is particularly interesting and exciting. Often, people think that visual art or experiences are not of interest to people who are Blind/Low Vision. In conversations we have about making movies accessible to people who are Blind/Low Vision via Actiview people ask, “But do Blind people even go to the movies?” The answer is a resounding, “Yes!” And this is no different for other forms of visual art as well. Last year Georgina worked with the Contemporary Jewish Museum of San Francisco on a project called “Hapitc Encounters”. For many people who are Blind/Low Vision, touching visual art pieces is the best way to enjoy and experience the art. Museums can be reluctant to offer widespread “touch tours” due to the fragility and nature of the art. So Georgina worked with the museum to create narrations of the touch experience that are shared with other art lovers who are Blind/Low Vision. Check out this video of Georgina describing pieces in the Contemporary Jewish Museum. Georgina has worked with other prominent museums such as the Metropolitan Museum of Art in New York and the Tate Modern in London. 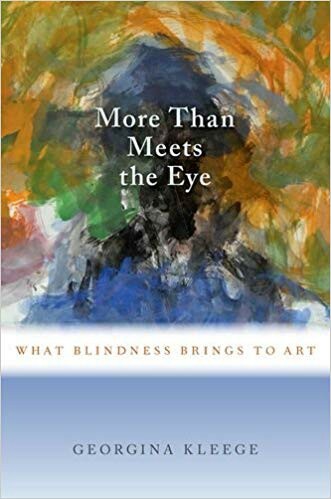 With her recent book, More Than Meets the Eye: What Blindness Brings to Art, Georgina aims to broaden the awareness of how more museums and visual art exhibitors can make the art accessible to the Blind/Low Vision communities. More Than Meets the Eye: What Blindness Brings to Art — Georgina Kleege. Book cover with an abstract painting in the background and light blue and white banners. In the Spring, Georgina will be teaching a course about Audio Description across the arts at UC Berkeley. The class will look at all forms of visual art including film, art museums, theatrical performances, dance performances, and others. Her students will be learning first-hand how to write and curate Audio Description in a way that enhances the art of the narration as opposed to focusing specifically on the functionality. Thank you for your great work, Georgina! We’re excited to follow your continued success in making visual art accessible for all. Want to learn more about Georgina and her work? Check out these articles and resources. To learn how Actiview is working to make movies and the entertainment experience more accessible and inclusive visit activiewapp.com. Do you know someone working to make the world more accessible? We’d love to learn about them! Email us at team@actiview.co.